The Buck trail is located in the southern area of the Plateau Division of the Uncompahgre National Forest near Montrose, Colorado. The trail begins off of Forest Road #560 near the start of the Dry Creek trail where it heads south for a short distance before turning back to the north along the forest boundary and crossing Highway 90. From there it continues along the boundary for another 1.8 miles before making a dogleg to the south and then north again and at the 4.6 mile point it climbs to the top of a little hill that is known as the 'Knob'. From there the trail works its way south again until at the 8.3 mile point it crosses Highway 90 once more. At the 9.3 mile point the Buck trail crosses the Divide Road where it continues to the 9.6 mile point and comes to an end when it meets up with the Aspen trail. For this post we started out at the Buck trailhead that is at the forest boundary and Highway 90. To get there just follow Highway 90 for a little over 20 miles from the center of Montrose where the trailhead will be on the right. This spot is 1.1 miles from the beginning of the Buck trail if you were starting at the Dry Creek/Buck trailhead at the end of Forest Road #560. For those that want to start from that trailhead keep driving on Highway 90 for another half mile or so. The Buck trail is a well worn singletrack that gets most of its use from both mountain bikers and dirt bikers. It is also a good trail for hunters and hikers that are out to watch the wildlife. For the first couple of miles the trail travels along the forest boundary. Most of it is fairly smooth other than the occasional tree roots and patches of rocks. On the day that we were taking the photos for this post it had rained the night before and we noticed fresh bear tracks in several places on this part of the trail. Measuring from Highway 90 the 'Knob' comes up around the 3.5 mile point of the trail. After climbing to the top of the Knob the trail turns back toward Highway 90. As the trail heads back toward the south it begins gaining in elevation. The gain is hardly noticeable at first. The elevation profile shows how the climbing looks once the trail is past the Knob. The steepest parts of the trail are a couple of draws that the trail climbs in and out of. The last draw has some loose rocks and dirt making it a bit rougher than the others. With the occasional deer and elk and the peaceful forest to enjoy it is easy to see why the Buck trail is so popular. A little past the 6.5 mile point the trail comes out onto a double track and at 7.1 miles it crosses the Parallel trail which is running along the powerlines at that point. Some mountain bikers use the route along the powerlines to create a loop for the Buck trail that should come out be to around 11 miles or a little more round trip. Staying on the Buck trail it crosses Highway 90 at the 7.3 mile point. Taking Highway 90 back would be another loop option. After crossing Highway 90 the Buck trail has a different feel to it as it travels around an upper branch of the Dry Creek drainage. 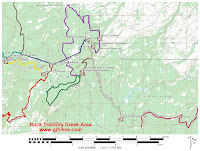 At the 8 mile point a 0.7 mile long spur trail comes up that connects the Buck trail with the Dry Creek Spur trail providing yet another loop option. At the 8.2 mile point the Buck trail crosses the Divide Road and continues for a little more than a quarter mile to where it meets up with the Aspen trail and comes to an end. The Aspen trail is a 6 mile loop that some mountain bikers like to combine with the Buck trail. On the day we were taking these photos we followed the Aspen trail to the left to get to the Dry Creek Spur then took that down to the Dry Creek trail and followed that up to the Dry Creek/Buck trailhead where we rode the final 1.1 miles around the first part of the Buck trail to where we started out along Highway 90. That loop came out to be 12.6 miles and took about 5 hours with all the picture taking along the way. 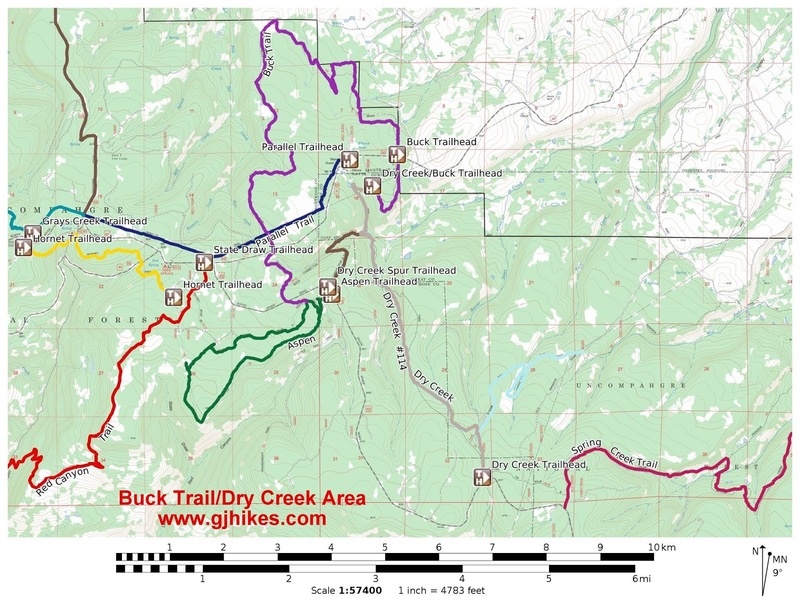 However you plan it out there are lots of options to choose from with the Buck trail. If you would like to see it for yourself then all you have to do is grab your bike or 'Take a hike'.